Ahh, whiskey – its cozy warmth is the perfect thing to sip on during the cooler months of fall and winter. It’s also the perfect base to build all sorts of cocktails especially that Golden Aged classic, the Old Fashioned! Did you know that the Old Fashioned is the closest relative to the first original cocktail? The first cocktail consisted mainly of spirit, bitters and sweetener (and water in the form of ice) and there are a great many variations you can riff on. The latest season of my cocktail show Kathy Casey’s Liquid Kitchen is full of Old Fashioned variations to try. My ROOT Bourbon Old Fashioned with Carbonated Cherries! My Evander Old Fashioned uses two of my favorite spirits – rye whiskey and gin! Stirred with Cointreau, housemade Spiced Angostura syrup and a dash of peach bitters, this spin on the classic turns it on its head. For a real flavor of fall my Maple Bourbon Old Fashioned combines the sweetness of real maple syrup with bourbon as well as a dash of both Orange and Creole bitters for an overall smooth, sipping experience. The Spiced Angostura Syrup is also delicious stirred or shaken into other classic cocktails such as a Collins, or a Manhattan. For a demo on how to make this drink and how to make the Spiced Angostura Syrup, check out www.LiquidKitchen.tv. Measure the gin, rye, Cointreau, syrup, and peach bitters into a mixing glass. Fill glass three-quarters with ice. Stir with a barspoon. Strain into an old fashioned glass filled with fresh ice or a Glace Luxury Ice Sphere. Spritz lemon disk over drink then tuck in the drink. Bring water, honey, spices and bitters to a boil in a small pan. Immediately remove from the heat and let spices infuse for 1 hour. Strain syrup through a fine mesh strainer. Then stir in the lemon juice. Store refrigerated for up to 2 weeks. Real maple syrup is so tasty in this cocktail – it adds not only a touch of sweetness but also a depth of flavor. Be sure to use a high quality maple syrup and keep your maple syrup refrigerated when not using. For a demo on how to make this drink, check out www.LiquidKitchen.tv. Measure bourbon, maple syrup and bitters into a mixing glass. Fill 3/4 with ice and stir swiftly for 20 seconds. Strain over fresh ice into an Old Fashioned glass. Squeeze orange disk over top of drink and drop in. It’s almost here and tickets are selling fast! Held at the beautiful Tulalip Resort Casino, this year’s Taste of Tulalip will feature over 120 wines from Washington, Oregon, California, Italy and France, paired with the Resort’s outstanding fare. Thirsty Girl‘s Leslie Sbrocco is back to help judge the Rock-n-Roll Cooking Challenge alongside special Guest Chef Marcus Samuelsson, Chef Wayne Johnson and Mauny Kaseburg! Make sure you mark your calendars and buy your tickets fast for Friday, November 9th and Saturday, November 10th. This week on Kathy Casey’s Liquid Kitchen, I stir up a Martini with Orange Bitters paired with Bitter Orange Fennel-Roasted Walnuts! This classic gin martini gets the much welcome addition of orange bitters. 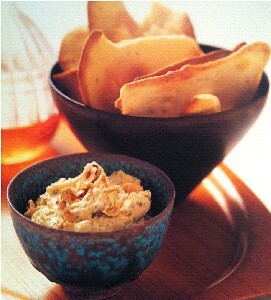 And every d’lish cocktail deserves an equally tasty nibble. Serve this cocktail alongside these spiced walnuts for some easy holiday entertaining! We are so lucky in the Pacific Northwest to have so many craft breweries. I particularly love this time of the year because all the seasonal specialties come out. Rich, flavorful pumpkin ales and stouts full of spicy warmth – yum! But these brews aren’t just for drinking – they can liven up your dinner (or dessert!) plate with their unique crafted flavors. Seattle institution Pike Brewing Company releases their seasonal Harlot’s Harvest Pike Pumpkin Ale in the fall. They use real pumpkin puree, brown sugar and spices like allspice, nutmeg, ginger and clove. I’m telling you this is d’lish – I had it recently in a pumpkin ice cream – wow! How delicious would this ale be splashed into a pumpkin bisque, or baked into spiced cupcakes—or have you ever had caramel sauce made with ale? Or how about their Auld Aquaintance Hoppy Holiday Ale? Just the name puts me in a festive mood – with its delicious hints of orange peel, coriander, cinnamon and nutmeg! This makes me want to drink that with my holiday turkey this year! Other notable seasonally-inspired sips around the city include Elysian Brewing Company’s Night Owl Pumpkin Beer, which is made with roasted pumpkin seeds. The Elliott BayBrewing Company’s Mashing Pumpkin is made of organic Oregon pumpkins and spiced with cinnamon, ginger, cloves, and nutmeg. Both of these are already making me feel warm and toasty inside! I love making my Cheddar Ale Spread with robust Northwest ales. Perfect for a party or during game day, this along with my Overnight Rosemary Semolina Flat Bread are some of my go-to’s for easy entertaining this time of year. You can keep the spread, refrigerated, for up to 4 days. Bring it to room temperature about 1 hour before serving. For even baking, rotate the pans in the oven and switch them from upper to lower racks midway through baking. In a large bowl, combine the yeast, sugar, and 1 cup of water. Add 2 tablespoons of oil. Let sit for 10 minutes until foamy. In a medium bowl, mix 2 1/2 cups of flour, the rosemary, semolina, and 1 teaspoon of salt. Add the flour mixture to the yeast mixture, stirring with a large spoon to combine. Then, using clean hands and working in the bowl, mix until the dough comes together. If needed, add another 2 tablespoons warm water and continue mixing dough into a ball. On a lightly floured surface, knead the dough for about 4 to 5 minutes. Drizzle the bowl with 1/2 teaspoon oil and return the dough ball to the bowl, turning the dough to coat well with the oil. Cover the bowl with plastic wrap and refrigerate overnight or for up to 24 hours. When ready to bake, preheat an oven to 425°F. Meanwhile, cut the dough into 8 wedges, then cover with a damp towel and let sit at room temperature for 10 to 15 minutes before rolling. On a lightly floured surface, roll out each wedge into a 5-by-10-inch rectangle. Brush or drizzle with oil and sprinkle with salt to taste. Arrange on ungreased baking sheets and bake for 10 to 15 minutes until golden and crispy but not overbrowned. Calling all Seattle Foodies! Frantic Foodie Keren Brown has planned the next Foodportunity for next Monday, October 22nd from 6-9pm at Tom Douglas’ Palace Ballroom! Tasty nibbles will be available from participating partners, including Peaks Frozen Custard, Tulalip Casino’s Tulalip Bay, Zinnia Bistro, and more. This event is open to all food lovers from food journalists, bloggers, public relations professionals, restaurateurs, farmers, companies and all food-passionate people. Make sure you buy tickets in advanced as this will be a hot event! This week on Kathy Casey’s Liquid Kitchen, I make my Solera Sherry Punch! With the winter holidays fast approaching, make your guests this easy to pre-batch, crowd-pleasing cocktail. My punch cocktail highlights the sherry’s earthy elements while the bitters, fresh citrus juices and rum complement the sherry’s rich, intense warming character. I love to top this drink off with edible 24k gold flakes to give it some bling-bling! Why do I wish for rain every fall? Because as soon as it begins, our Northwest grounds moisten and the magic begins. Local wild mushrooms start to pop up! Chanterelles, the fragrant matsutake, cauliflower mushroom (its genus name is Sparassis but it does look like a big cauliflower), angel wings, hedgehog, oyster … the Pacific Northwest has a bounty of edibles yours for the finding. Wild mushroom foraging is one of my favorite activities during the fall season. 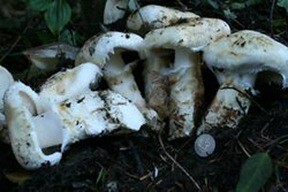 Tasty matsutake mushrooms – nom nom nom! I have been a huge foraging enthusiast for years. It’s how I met fellow mycophagist (mushroom eater/lover) Patrice Benson, who let me tag along through the years to her secret mushroom-picking spots. Of course, I never know exactly where we are going because, like any good mushroom hunter, Patrice would never tell me exactly where we were. Lucky for her, I’m so directionally challenged that I wouldn’t be able to find my way back if I tried! 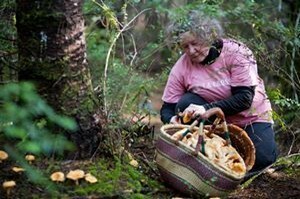 For over 20 years, Patrice shared her amazing mushroom knowledge with local enthusiasts and chefs, teaching everyone the ins and outs of seeking wild mushrooms. Patrice passed on recently but I know she will be with us in spirit this year as we seek out the first of the season’s mushrooms. Dear friend Patrice Benson with a bounty of mushrooms! Look at all those Chanterelles! Thank you, Patrice, for sharing your wonderful knowledge with me and so many others. If you’re curious about foraging but have never been before, I highly recommend checking out the Puget Sound Mycological Society. They have scores of info for wild mushroom lovers of all backgrounds. From budding beginners to seasoned professionals, the PSMS has all sorts of activities and programs to keep you hunting! Speaking of activities, this weekend is the annual Puget Sound Wild Mushroom Show held at the Mountaineers Club (located in Seattle’s Magnusson Park), where there will be hundreds of species exhibited. The PSMS has put on a wild mushroom festival every year since 1964. Their two-day fair is one of the largest in North America. There’ll be guest speakers, program/membership info, an art contest and of course cooking demos! I’ll be cooking up some wild mushroom fun on Sunday (Oct.14) from 2-4 pm — and sharing my “When I Found the Mother Load” story. General Admission is $10 and fun for all ages! Don’t fret if you can’t make out to the show! There is another great opportunity for wild mushroom foragers – the 27th Annual Breitenbush Mushroom Gathering! Held at the Breitenbush Hot Springs on October 18th – 21st, attendees will focus on the diversity of the wild mushrooms in the Pacific Northwest and the many functions that mushrooms have for both humans and the natural world. Whether it’s in the woods or from your favorite farmers market, use up this season’s chanterelles in my Savory Chanterelle Bread Pudding one of my favorite wild mushroom recipes. If you do get a chance to go mushroom hunting, pack up some extra ingredients (as well as rustic breads and a bottle of wine! ), a cast iron skillet, a few other staple ingredients and a portable burner – then try making my Wild Mushroom Ragout after pulling in your day’s bounty of mushrooms. So yummy slathered over thick slices of rustic bread and a glass of vino after an exhilarating day roaming the woods for the big find. It is important to use a rustic-style bread for this recipe—not airy bread. Preheat an oven to 325°F. Heat the oil in a large sauté pan or skillet over medium-high heat. Sauté the chanterelles and onion for 3 to 4 minutes, or until three-quarters done. Add the celery and sauté for about 1 1/2 to 2 minutes more. Add the garlic and sauté for 30 seconds more, taking care not to burn the garlic. Remove from the heat. 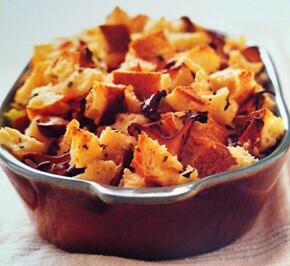 Combine the bread cubes, herbs, salt, and pepper in a large bowl. Mix in the cooked mushroom mixture and set aside. Butter a 6-cup glass or ceramic baking dish or spray with vegetable-oil cooking spray. Whisk the half-and-half, milk, eggs, and egg yolks in a medium bowl. Pour the egg mixture into the bread mixture and mix gently and thoroughly. Transfer the mixture to the baking dish and level out the surface, lightly pressing the bread down into the dish. Bake for 50 to 60 minutes, or until the custard is just set in the center. Do not overbake or the custard will scramble. 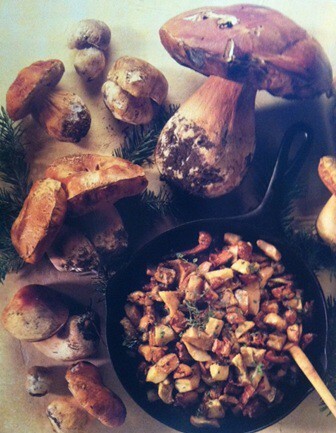 My Wild Mushroom Ragout – that’s a 12-inch cast iron skillet…making that Boletus huge! This is from my first book Pacific Northwest the Beautiful in 1993. Patrice picked these mushrooms for the photo shoot! From my first cook book – this recipe is still one of my favorites to enjoy after a long day of foraging. For a very rich flavor soak a few dried wild mushrooms such as Morels or Boletous (Cepes) in the brandy or sherry, then add to simmering ragout. Serve ragout in a big cast iron skillet and spread it on toasted rustic bread, or serve it over grilled fish or roasted chicken or pork. For making out on your foraging trip take some butter or olive oil, some fresh herbs, onion, garlic, a half pint of heavy cream and a little jar of sherry brandy and white wine mixed together, a lemon and some seasoning — delete the stock. Pack a portable burner, cast iron skillet, a spoon, small cutting board, knife and a loaf of rustic bread. And wish for lot’s of mushrooms. In a large heavy bottomed skillet or small brazing pan. Melt butter over moderately high heat, add onions, mushrooms and garlic. Cook mixture, stirring often till mushrooms and onions are softened about 3-4 minutes. Add herbs, stock, sherry and brandy. Reduce till only a little liquid remains about 5 minutes or more depending upon if your mushrooms have a lot of moisture in them. Add whipping cream and cook till mixture is a nice lightly thickened about 3-5 minutes. Add lemon juice. Cook for a couple more minutes. Season and stir in parsley.